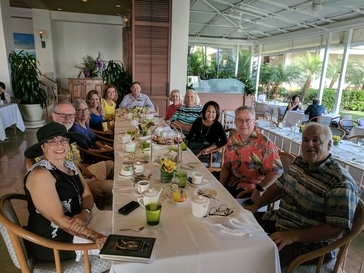 Our 2019 Belated Birthday Tea, on February 2 at Orchids at the Halekulani in Waikiki, was a great success and enjoyed by all. We were especially privileged to have visitors from the Portland, Oregon JASNA region. In a lively round of Jane Austen Volleyball, the Emma team triumphed over the Elizabeth team by a score of four to two; elegant door prizes were awarded; and of course the weather was wonderful, the tea service excellent, and the views of the Pacific Ocean and Diamond Head unmatched. Our next event will take place on Saturday afternoon, April 27, when we'll be discussing 'Pride and Prejudice.' Visiting JASNA members are always welcome; contact us for details.